When I started TEN7 in 2007, human resources service options for small companies were few. Most payroll options were designed for large companies. So, we did what everyone else was doing—we went with ADP. ADP charges you each time you run payroll, with an additional charge per employee or contractor. Since we were only a few people at that point, it wasn’t expensive. When we hired more contractors, and changed some to be employees, ADP continued to be useful to keep track of payroll. We weren’t thrilled with the user interface, but we really didn’t have any other options. A few years in, we noticed that employees were leaving, and lack of comprehensive benefits was often cited as a primary reason. I decided we needed to compete with others in industry and offer retirement and other benefits. When we decided to offer a simple IRA benefit, ADP had an option to manage that. Well, we stayed with them because we really didn’t have any other options at the time (around 2012). After about two years, we wanted to be more competitive and decided to offer a 401(k) with a 4% matching contribution. We thought that managing a 401(k) was something complicated that large corporations did, so we stayed put and used their 401(k) plan management. We also assumed everyone else’s fees were the same. That’s when I saw an episode of Last Week Tonight with John Oliver that talks about his company setting up retirement plans for their employees. I was horrified. People are getting screwed! And I’m the employer. Maybe I’m screwing my employees too! I decided to look into it. While I was researching, I read a blog post by the CEO and founder of Guideline, Kevin Busque titled "How I'm Fixing Your 401(k)". Guideline is a full-service, full-stack 401(k) plan. At that point I understood the 401(k) ecosystem more than I previously did, and realized Guideline was doing something very smart. Their business model was subscription as a service, vs. a fees-based model. Their goal was to have the lowest number of fees, and have it be their point of differentiation. Guideline uses Vanguard (home to some of the best performing funds and lowest fees) to manage the 401(k) plans. Guideline brought all their fees in house, and they charge probably half of what we’d been paying to ADP, which was several thousand dollars every year. So in early 2018, we switched to Guideline. The only fee I have to pay now is a flat monthly, per-employee subscription fee. I also appreciate Guideline’s transparency—as honesty is a primary value at TEN7. More importantly, my employees aren’t getting screwed, as there are no hidden fees. In fact, they don’t have to pay any administration fees at all. The only fees they‘re responsible for are the ones associated with the Vanguard funds they buy, and those fees are the lowest in the industry! There are charges for some additional services, like distributions or if someone wants to take out a loan against their 401(k). 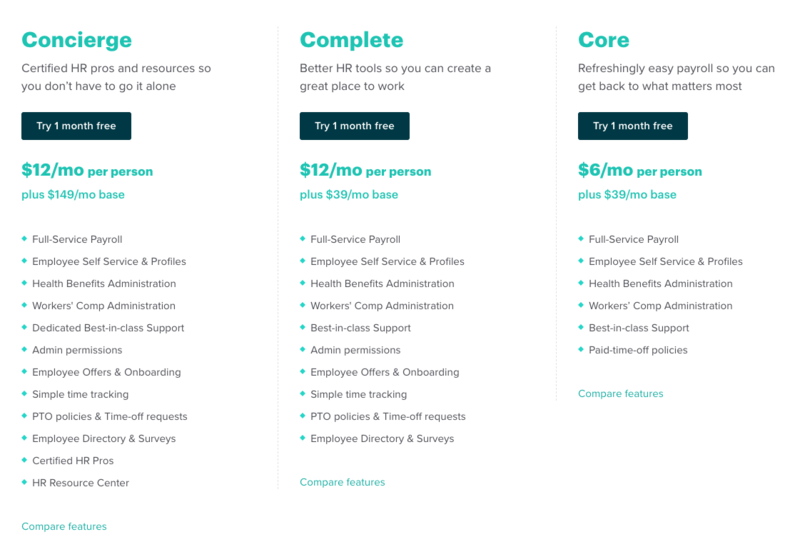 So aside from lack of fees, another reason I’m a huge fan of Guideline is their modern, beautiful user experience. ADP let me and my employees manage things online, but their UI is by no means modern. Well, that’s being kind. It looks like a Windows application from 1999. I knew that my employees rarely logged in to manage their accounts, because I’d get way too many of them asking to reset their password. We used ADP for both payroll and 401(k), and there were two radically different-looking websites for those functions. In contrast, the Guideline interface is beautiful and intuitive. It’s obvious they paid a lot of attention to the user experience. Our employees can log in, see what their contributions are and make changes at any time, with no restrictions. On the administrative side, the rollover process was easy, and Guideline’s support team is fantastic: everything you’d expect from a modern software startup. Something else that Guideline helps me with is compliance reporting. As a new business owner, I really didn’t know what 401(k) compliance was, or what I needed to do to be compliant. With ADP, I never was really sure if we were compliant. With Guideline, I get an annual email that asks me to answer some questions to determine if my company is compliant. I answer them and I get a reply back that either says, “Awesome! You’re compliant!” or “Your compliance status is pending.” If I’m for some reason not compliant, it will let me know why. 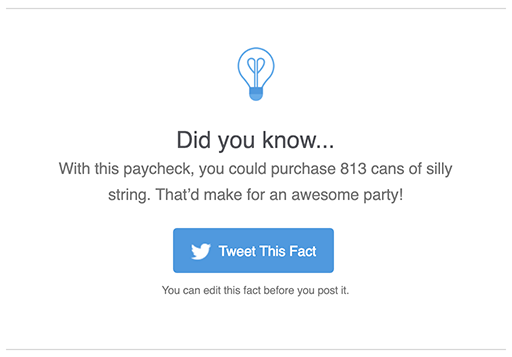 For example, right now it says that some employees have contributed more than the yearly maximum. Within ADP, i wouldn’t have even known where to look inside the application to find out whether I was compliant—the interface was so confusing. 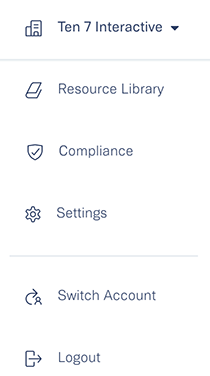 In Guideline, there’s a COMPLIANCE menu item right up front! Oh, and to add insult to injury, when we stopped using the 401(k) component of ADP, they charged us a cancellation fee disguised as a “processing fee.” It started out as $1,500, but after we searched our ADP contract for a mention of such a processing fee (and couldn’t find any), we negotiated it down to $750, just to be done with them. Last year we also knew we wanted to find a new option for payroll. 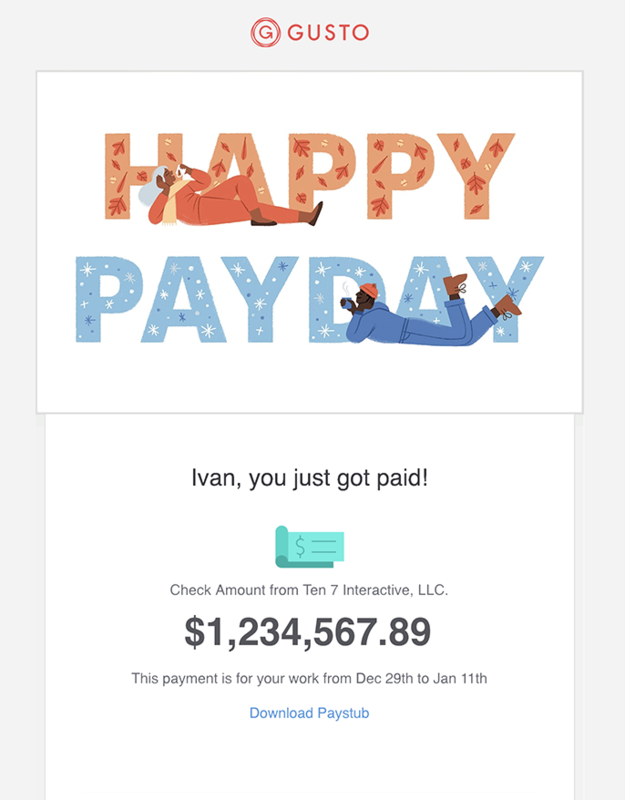 Since we’d found a good solution to our 401(k) needs with a startup, we had a good feeling there would be new payroll services available for small businesses too. 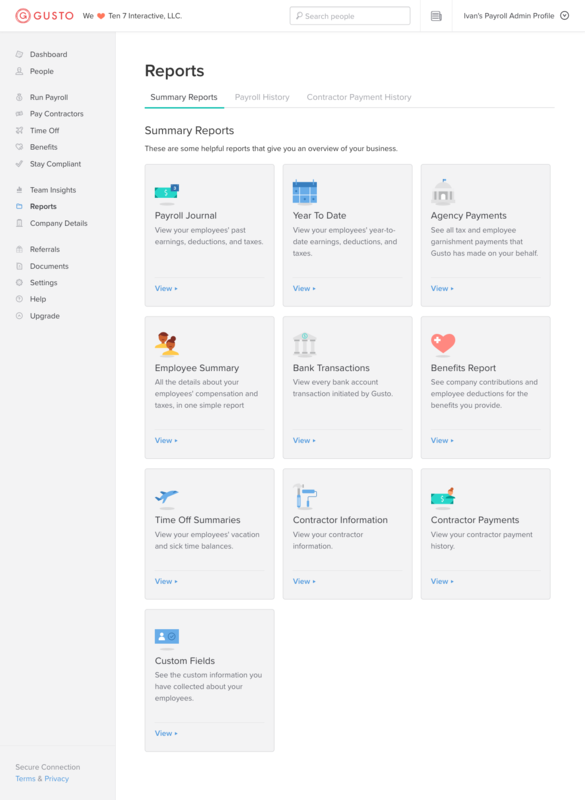 We wanted to leave ADP payroll for the same reasons listed above; we wanted a better user experience for everyone: employees, contractors and the administrator (me). Another reason was we wanted to integrate payroll with other parts of our business, and ADP didn’t offer what we needed. In my research for a new payroll provider, Gusto kept coming up. It is another modern software company, that provides API integrations with other providers. For example, it integrates with Quickbooks, which we use for accounting. What sealed the deal is that we found out that Gusto and Guideline have a strategic partnership! Just like Guideline, costs with Gusto are transparent. We’re on the “Complete” plan, which costs a monthly base fee of $39 plus $12 a month per person. ADP payroll pricing was NOT transparent. We never knew exactly what we were going to pay. Every two weeks I got a bill, and it would usually include some discount. The discount changed from month to month, or we saw a note that we had “preferred pricing.” We never knew if the discount or “preferred pricing” would continue. Also, why was I getting preferred pricing? It was a mystery. But enough about ADP. Let me tell you more reasons Gusto is fantastic! It’s clean and simply designed. The setup was easy and intuitive. The messages and communication were written to sound like friendly humans. Employees can update their profile and withholding at any time, see their accrued PTO and other details. 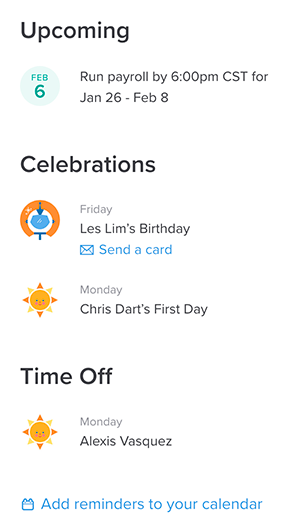 Employees can submit PTO and time off requests within Gusto, and I approve them there. When payroll comes around, they get paid without me needing to do anything else! In ADP there was no way to request time off, so we used to have to track PTO accrued and used in multiple places. It’s so nice it’s all in one place now! I can pay contractors at will. With ADP, I had to run contractors with regular biweekly payroll. I can run payroll for employees automatically, without even interacting with Gusto every period: payroll autopilot. 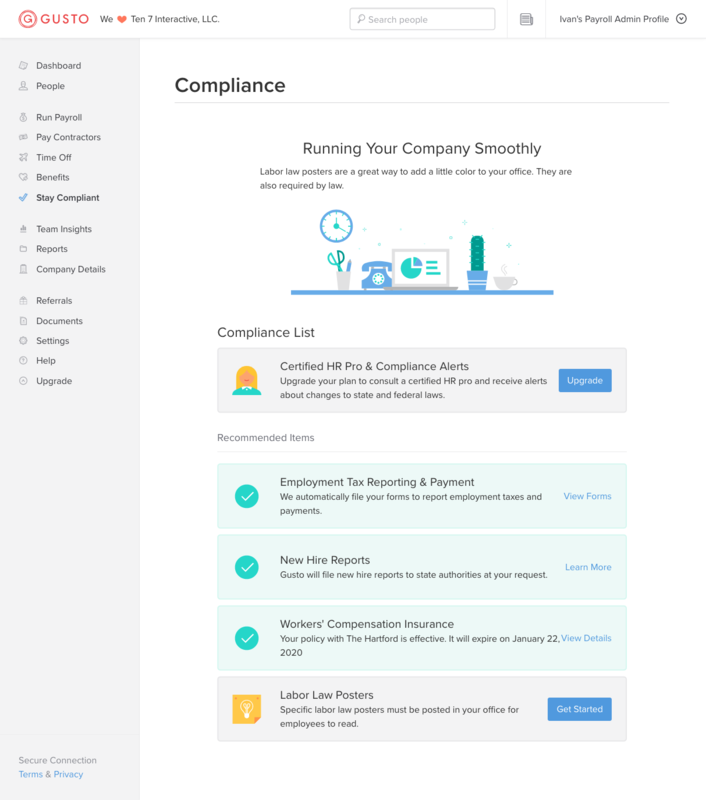 There’s a handy “compliance” area in Gusto too, so I know at a glance whether my business is compliant with employment tax reporting, like whether new hires have filled out the required paperwork, etc. It notifies me when it’s time for W2s/1099s for tax time. They have capabilities for new hire offers and onboarding (which we haven’t implemented yet). That would include things like a place for new employees to sign their paperwork, like appropriate government tax forms. They have employee surveys (Team Insights), but we already use something called “Know Your Team” that we like. They also offer time tracking with this plan level, but since we are already using JIRA to track billable time, we don’t need it. ADP is a legacy payroll and HR application, and for many years it was the only option for companies big and small. But today, many startups have been created to serve smaller businesses with a focus on making the user experience easier—and dare we say—delightful.